Significantly damaged passports are automatically invalidated and can no longer be used for international travel. The definition of what actually constitutes a significantly damaged passport is not easy to ascertain. Even Federal Regulations do not offer a lot of help on this subject. "The passport has been materially changed in physical appearance or composition, or contains a damaged, defective or otherwise nonfunctioning chip, or includes unauthorized changes, obliterations, entries or photographs, or has observable wear or tear that renders it unfit for use as a travel document, and the Department either takes possession of the passport or sends a written notice to the bearer." The most difficult description to understand is "observable wear and tear". How "observable" does the damage have to be in order for it to be rendered invalid. Are dog-earred pages sufficient wear and tear to render the passport unusable? Not usually. What if the gold on the emblem has been rubbed off? Not a big deal. What if you accidentally washed a passport resulting in faded pages or a loose binding? This one is a little more difficult to answer. And how are you to know if the RFID chip is "damaged, defective or otherwise nonfunctioning" until it is scanned at the airport? Tears and holes are definitely considered significant damage especially if they are found on the cover or personal data page. Unofficial markings on the data page can get it invalidated. It is much more difficult to determine the degree that water damage has affected the passport. Due to the relative nature of the regulation, we always encourage American citizens to replace a damaged passport if they have any doubt at all about its usability. Yes, you will have to pay the fees to get a new passport but it is probably better than the hassle of having to reschedule or cancel an international trip at the last minute. If your passport has been damaged and you want to apply for a replacement, you can do this by following the same steps that are required in order to obtain a new passport. The only additional step is you have to submit the damaged passport along with the application form and supporting documents. 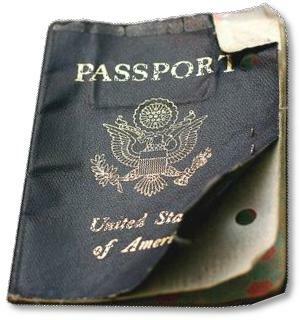 For security reasons, damaged passports may be retained. Passport with only normal wear and tear can be renewed by mail. The application to replace a damaged passport using standard service takes 4-6 weeks to process. You can accelerate the process by requesting expedited service. The replacement passport should be delivered to you within 2-3 weeks. What if you need a new travel document much quicker? Regional passport agencies can process same-day passport applications for citizens of the United States who have urgent travel plans. There are two ways to get this done. One, schedule an appointment at the nearest regional agency. You will have to travel to the agency and submit the application yourself. If you live far away or do not have the time to commit to the process, you can use the second alternative. Authorize a qualified passport expediter to submit the application for a replacement for you.